Harry Redknapp has refused Steven Gerrard's demand to name and shame the ex-Tottenham stars the Premier League boss claims skipped England duty. He said: "I don't want to get into naming names because it wouldn't be fair to the players." Roy Hodgson has announced the England starting 11 for the World Cup group game against Costa Rica tomorrow. Goalkeeper Joe Hart, defenders Phil Jagielka, Glenn Johnson and Leighton Baines, midfielders Steven Gerrard and Jordan Henderson and attackers Wayne Rooney and Raheem Sterling are all dropped from the side that lost to Uruguay. The team in full: Foster; Shaw, Cahill, Smalling, Jones; Wilshere, Lampard, Milner; Barkley, Lallana, Sturridge. Players trying to avoid England duty is "nothing particularly new", according to the former manager of the national team, Graham Taylor. The issue has come under the spotlight after Harry Redknapp claimed "two or three" of his former players at Tottenham had asked him to help them get out of playing international games. But Taylor, who also managed club sides Watford and Aston Villa, said players were sometimes pressurised by their managers to avoid playing in international fixtures. He told BBC Radio 5 Live: "There are certain games and certain players who don't want to be involved in games like that. As much as we blame the players, they are put under pressure, sometimes by their club managers." England midfielder Frank Lampard has said he is undecided on whether he will continue playing international football after the World Cup. He will be playing for a new team next season after his contract at Chelsea expired in June, but he has yet to decide on a move. "I don't know whether I will (retire) or not. I am going to get home and make a decision at that point because I have my own (club) future to sort out as well," Lampard told BBC Radio 5 Live. "This is not the time and place to make the decision. Sometimes when you are away for a month you don't always come up with the right judgement." QPR manager Harry Redknapp has refused to name the players he said wanted to avoid playing for England when he was manager of Tottenham. He had said that when he was at the north London club "two or three players" had asked him to get them out of playing for the national side. Redknapp was challenged by current England captain Steven Gerrard and manager Roy Hodgson to back up his comments by naming the individuals involved. But he has refused to give more detail, telling the Daily Mail: "I understand Steven's concern but I don't want to get into naming names because it wouldn't be fair to the players." However he insisted the problem of players not wanting to represent England was widespread, adding: "Every Premier League manager past and present knows what I'm talking about. Probably even Roy Hodgson. But sadly this attitude is not unusual these days." "You've only got to look at how many players pull out of an international game on Tuesday and Wednesday then are running about for their clubs the next Saturday to see that this is a very real issue." Why do England fail in major tournaments? Are we sub-standard at grassroots? Or is it simply a lack of passion for the shirt? As ever, the answer seems a little more nuanced. Roy Hodgson and Steven Gerrard have urged Harry Redknapp to "name and shame" players he claims sought help to avoid England duty when he was manager of Tottenham. Redknapp, speaking on BBC Radio Five Live's Sportsweek programme, said he had dealt with "two or three" players who did not want to play for England during his three-and-a-half-year spell at White Hart Lane. The England captain and manager responded, insisting no players in the current set-up held such feelings. "Who?" Gerrard asked, "Name them. We need names. I don't know who he means. Five years ago? 10 years ago? "If it's the case, it's disgusting." Hodgson added: "In the two years I've been here, I've seen a greater interest in playing for England, so Harry's comments come as a bit of a surprise." England's manager and captain faced the press today for the first time since their early exit from the World Cup was confirmed. 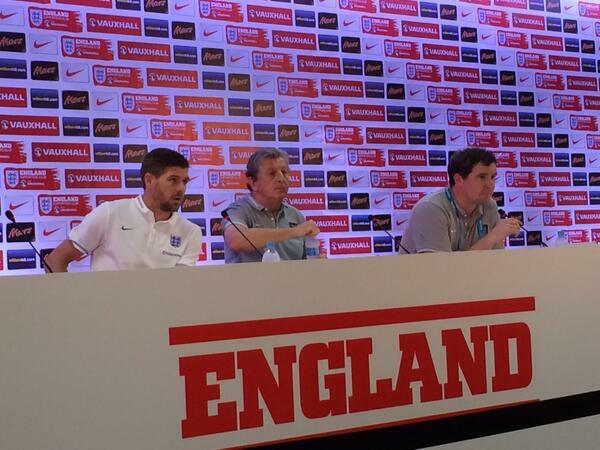 Roy Hodgson and Steven Gerrard admitted emotions are still raw. Gerrard is yet to decide whether he will retire from international football. Steven Gerrard said he "needs a holiday" to clear his head before he makes any big decisions about retiring from international football. England Captain Steven Gerrard has addressed rumours of his retirement from international football following England's defeats in Brazil, telling a press conference "I won't be making any announcements in the next week".